Barricades have been installed at the entrances to two fishing access sites and a state park in Montana Fish, Wildlife & Parks Region 7. 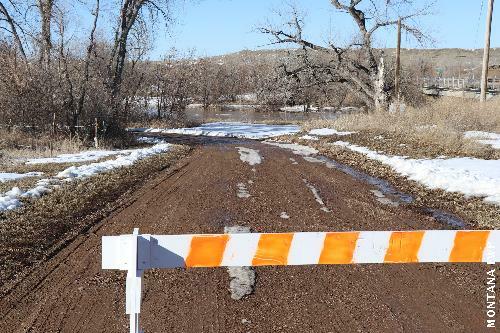 The public is advised that road access is partially restricted at Twelve Mile FAS and Pirogue Island State Park near Miles City, and at Black Bridge FAS near Glendive. The area is experiencing warming temperatures, rapid snowmelt and rising creek and river levels, which is causing high-water conditions and safety concerns at these sites. On Wednesday, ice jams on both the Tongue and Yellowstone Rivers near Miles City broke up, further increasing flows.